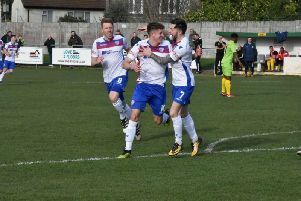 Liam Dolman insists concentration is the key as AFC Rushden & Diamonds look to get to grips with the Evo-Stik League South Premier Division Central. It’s been a tricky start to life at Step 3 for Diamonds following their promotion last season with three defeats in their first six games at the higher level after they had opened the campaign with a fine 5-2 home success over Redditch United. However, those three losses have only been by the odd goal leaving skipper Dolman to believe that if his team can cut out “the silly mistakes” then their fortunes will soon turn. Diamonds return to action after a 10-day break with a clash against St Ives Town at Hayden Road on Saturday. And Dolman said: “I think we will be raring to go after the break. “We need to bounce back in the league after a couple of disappointing results. “To be honest, aside from the FA Cup defeat at Hayes & Yeading, our performances haven’t been too bad at all. It is the silly mistakes that have cost us. “We are still learning about this league. The standard is obviously a lot better than it was in the division we were in last season. “We are in a league where anyone can beat anyone on their day and we have to realise that we aren’t just going to turn up and win 3-0 or 4-0 like we might have done last year. “We aren’t the best team in this league but we work hard and when we perform to our full capabilities, we can match any side. Dolman reached a personal milestone of his own in Diamonds’ most recent outing as he made his 200th appearance for the club in the 2-0 victory at Peterborough Northern Star in the first round of the NFA Hillier Senior Cup. He also scored the second goal, his 40th for Diamonds, for good measure. The centre-half has been the heartbeat of the team over the past few seasons during their rise up the divisions. “I’m really pleased to have made 200 appearances for the club,” he added. “I think it’s something that is quite rare at this level these days and this is my fifth season here. “I love playing here, it’s perfect for me and we have had a couple of promotions and been there or thereabouts in every season.